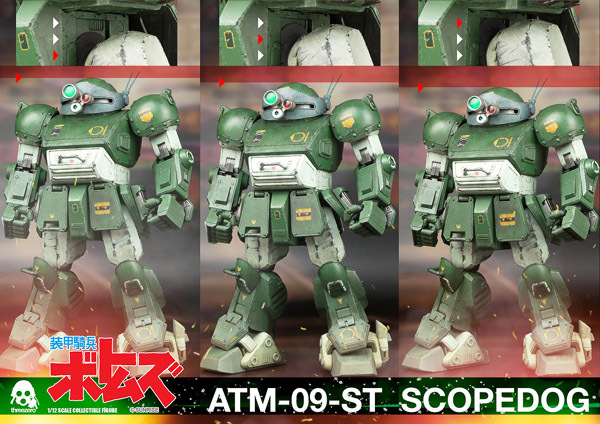 VOTOMS ATM-09-ST Scopedog1/12th scale collectible figure. 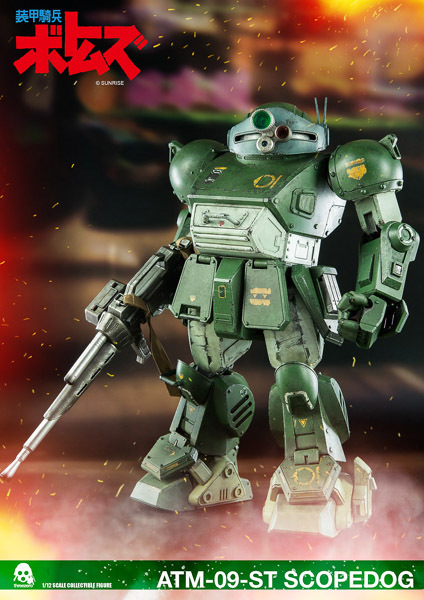 Armored Trooper VOTOMS is a military science fiction mecha animation series first aired in Japan back in 1983, featuring mechanical designs by great KunioOkawara. 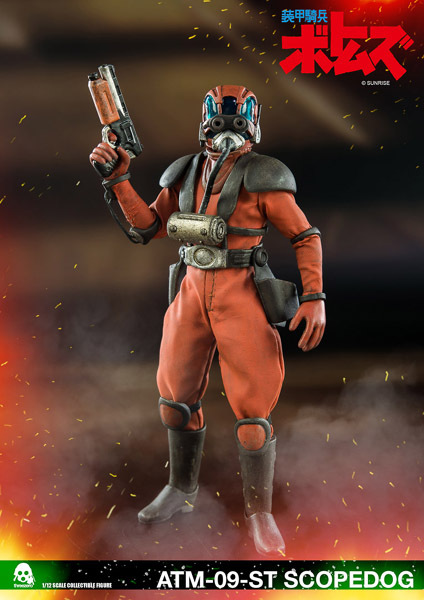 The fully-articulated and extremely detailed Scopedog figure stands at approximately 33cm (~13″) tall and covers the gimmicks seen in the animation series such as the rotation of the turret lenses, forearm extension gimmick for Arm Punch, and transformation into crouching mode and it also comes with a 15cm (~6”) pilot figure that can be positioned inside its cockpit. 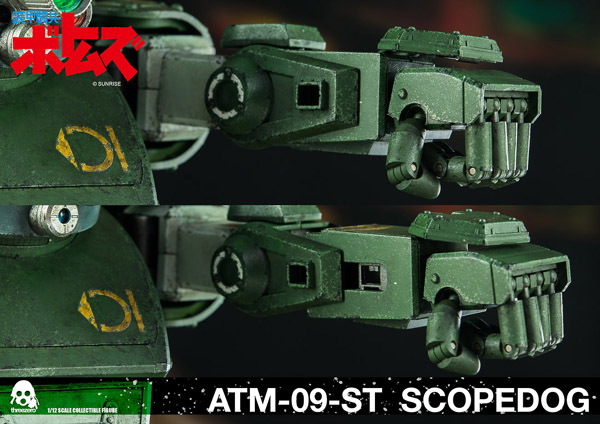 1/12th scale Votoms ATM-09-ST Scopedog collectible figure will be offered for pre-order at threezerostore.com for a limited time starting from August 29th 9:00AM Hong Kong Time. Scopedog price at www.threezerostore.com is 450USD/3500HKD with worldwide shipping included in the price. 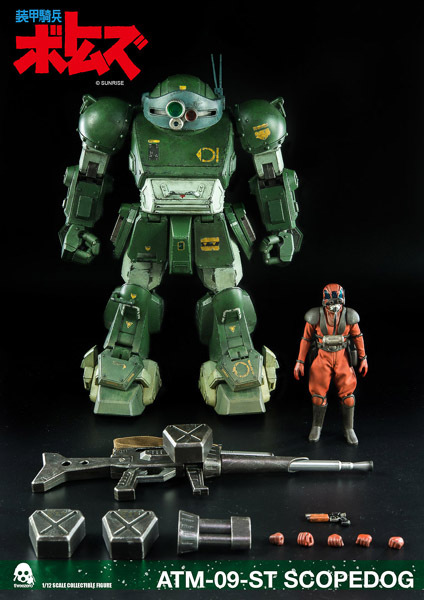 As part of special threezerostore exclusive offer: we will have Threezero Store Exclusive Heavy Weathering Version. The Scopedog 1/12th scale figure is fully-articulated including the finger joints, and also has a gimmick to transform into crouching mode. Also as a special feature of the figure, the pelvis joints can be adjusted vertically in 3-steps to adjust leg lengths. The magazines for Arm Punch can be inserted in the forearm, and the spare magazines can be mounted on the holders on the side hip armors. The hand-held GAT-22 Heavy Machinegun has a detachable fabric belt, barrel and stock, and can be converted into “short barrel” form. 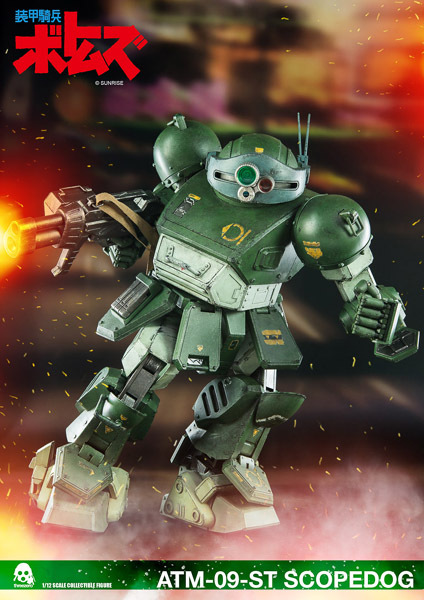 It also has detachable machinegun magazines which can also be mounted on the side hip armors. 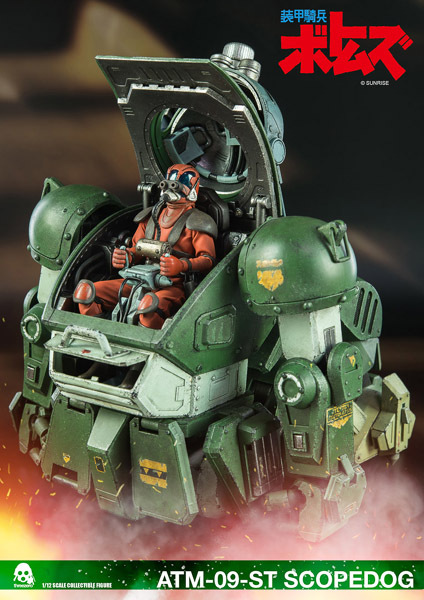 Scopedog also includes a 1/12th fully-articulated pilot that can be positioned inside the cockpit. 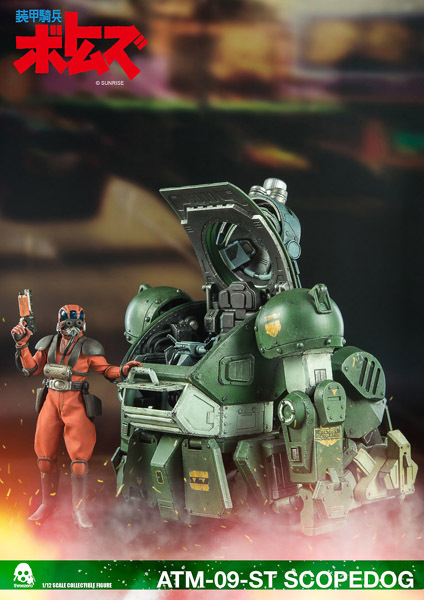 The pilot includes his own Bahauser M571 Armor Magnum accessory and 7 interchangeable hands (1 pair of fists, 1 pair of relaxed hands, and 1 pair of hands for holding control stick, one right hand for holding gun). Articulated Turn Picks and Roller Dash wheels on each foot. Arm Punch magazine holder (holds 3 Arm Punch magazines) x 2 (detachable). 7 interchangeable hands (1 pair of fists, 1 pair of relaxed hands, and 1 pair of hands for holding control stick, one right hand for holding gun).